Hello! Kistler here with more Tips & Tricks for Antorus the Burning Throne. As we collectively progress through the raid, changes will be made to this guide: pruning unnecessary tips and adding interactions found during progression. Please help me with this process by leaving a comment here or pinging me on Discord (Kistler#0524) if you feel I have either omitted a significant interaction, or more importantly, if you believe an interaction listed below to be incorrect. You’ll notice there are a few remaining italicized questions regarding how a handful of interactions play out. If you happen to know an answer or test one out yourself, please let me know. Thanks! Now get out there and kill some bosses! Remember, this is largely a trash-mob encounter—change your gear-set accordingly! (Mythic) Beware, Vanish breaks Chains during p3. Use this to your advantage if you’re not wearing Mantle. Once again, as we all experience more of the content (read: Mythic), this page will become more conclusive. Please comment anything you feel I may have unintentionally left out. I’ll work to update this page as frequently as possible—so check back! Feb 3rd: Kingsbane double application bug has been fixed and we have been compensated with a 4% damage buff. Our DPS remains the same as before the bug fix for most people while Rogues with CoF+Boots might see a slight decrease. Hello, my name is Yazuki I currently raid for the US 8th guild Encore and plan on constantly updating this guide in order to help as many people out as I can. You may be wondering why I’m putting in the effort to write a guide when there’s already so many guides available, well that’s because most guides are outdated or what they’re saying is simply just incorrect. I’ve noticed this because a lot of people approach me asking for help and the first thing I usually notice is that they’re doing something wrong that they believed was correct because a guide said so or someone told them it was the optimal thing to do. This guide will assume you already know the basics of assassination like our toolkit, optimal way to level your artifact, etc. Instead it will go more in-depth into how it’s played at the competitive level. If you are new to the class or spec I urge you to follow the other great guides on our website like Stjern’s Rogue Legion overview guide. My goal is to provide a guide that if you follow correctly will give you the confidence to play your class to the fullest potential. I only recently started taking raiding seriously on my Rogue for BRF in Warlords of Draenor and since the beginning of Legion, but I’m confident in how to play the class optimally because every tier I’m able to achieve rank 1 parses on multiple fights. Notably being #1 in the world for Emerald Nightmare and #2 in the world out of rogues for Trials of Valor. With the release of Heroic NH this past week I’ve gotten rank 1 on more than half the fights however logs are now private so refer to my stream vods if curious on how the fight is played out. This isn’t meant to brag but moreso to erase any doubts you have that this guide would provide any false or suboptimal advice. If you wish to talk to me I am always answering questions and plan on streaming all of my Mythic progression over at twitch.tv/yazuki. Raid schedule is currently Mon-Thurs 9-12 EST so head on over during those times and I’ll be more than happy to answer any questions you have. Assassination is a spec that excels at single target damage over a long period of time with strong multi-target cleave on up to 3 targets as long as uptime on them is high. The most important part of playing this spec optimally is having your raid leader understand the pros and cons of the spec and taking full advantage of it. This means assigning other classes who excel at AoE to AoE and letting Sin rogues do what they excel at which is murdering the boss or priority adds. So with the changes in 7.1.5 there are several differences in what talent we consider to be optimal now, however the playstyle of the spec remains relatively the same if you played with Agonizing Poison before the patch. With the nerfs to Elaborate Planning it is no longer the optimal talent this tier. Instead Master Poisoner is now the superior talent in every situation. It is important however to understand why that’s the case because at a glance, 12% increased damage still sounds incredibly strong. What this means for us is that just keeping 5 stacks of Agonizing Poison on the target alone gives us a permanent 6-7% increased damage buff with our current mastery levels which is further increased by Surge of Toxins. Along with the fixes to Kingsbane making it an important ability in our rotation, this talent is by far the superior choice. Nightstalker is the best talent in this tier because the first spell cast from Stealth deals 50% more damage. What this means is that on the opener and every 2 minutes afterwards you’re able to Vanish-> Rupture to take advantage of it. With the 7.1.5 changes to Deeper Stratagem and Rupture on top of losing 5% Critical strike chance, it no longer makes sense to take it. Instead we take Vigor as it is an overall better dps gain. Entirely fight dependent but the clear choices here is either Elusiveness or Cheat Death. Leeching Poison is strong on fights where healers struggle with throughput and there is little burst damage but that is extremely rare nowadays. Thuggee is the only talent that’s useful this tier in a raid situation, as it resets the cooldown of Garrote if the effected target dies. The other two talents require you to stun the target and in most raid encounters, mobs are immune to stun so they aren’t useful. Taking all the important 7.1.5 changes into consideration Agonizing Poison is the optimal talent to take in practically all cases despite being nerfed by 0.5% per stack. Some people will argue that Exsanguinate is still better but the truth is all the changes hurt the spec meanwhile Agonizing Poison benefits greatly from it. We can compare how the two fare with 7.1.5 changes to see why this is the case. 5% Critical Strike nerf is a huge nerf to the spec because most of the damage came from bleeds which doesn’t scale with our Mastery: Potent Poisons. After comparing the two you can see why Agonizing Poison is the superior talent choice this tier. With Exsanguinate the only way to scale bleed damage is through Elaborate Planning and Deeper Stratagem which are now inferior talents. So while the spec may be good for players who recently hit 100, the spec suffers greatly due to poor scaling and is the main reason why it is no longer taken for raids. Until they make any further changes to the other two talents, Venom Rush is the only viable talent this tier. In order to play Assassination optimally the first thing you need to understand is the spec isn’t one where you just spam all your abilities off the GCD. Instead of the fast paced play-style of Outlaw, Assassination requires you to think ahead and pre-plan everything if you want to achieve optimal dps. This is largely due to the fact that we have a limited energy pool which can’t keep up with the rate at which we can spam abilities. Understanding how our abilities work and interact with eachother is extremely important because once you understand the fundamentals of the spec, everything else will eventually fall into place and you’ll understand things easily like why some talents work while others don’t or why you use this opener instead of that opener. Vendetta : Our most important DPS cooldown which is used almost every time on CD unless there is a priority add or burst phase coming up soon. With the combination of Master Assassin relics and Convergence of Fates, your CD is on average 1 minute which lines up nicely with Vanish. Surge of Toxins : The trait which determines when we use our finishers and the amount of CP you should use them at. Despite what the tooltip says this trait actually scales with CP at 2% each meaning it’ll increase poison damage by 2% at 1 CP and 10% at 5 CP which means it is important to use your finishers at high CP to take advantage of this. It is important to note that Surge of Toxins does indeed scale with Agonizing Poison and it’s effects is further increased by Master Poisoner making it a vital part of our rotation. Rupture / Garrote : our two bleeds which should have near 100% uptime. These make up a huge portion of our damage and every time the bleed ticks it’ll refund energy through Venomous Wounds. It should be noted that while these abilities get snapshotted by the Nightstalker buff meaning the damage buff stays throughout the duration regardless of you leaving stealth, everything else is updated dynamically. This means that your bleeds will do increased damage when you activate Vendetta and then return to their normal damage after it expires. Envenom : Our standard finisher and the main ability used to keep Surge of Toxins uptime high. The buff it provides increases poison application rate by 30% which is essential to stacking Kingsbane very high. With our 4 pc set bonus Envenom is able to compete with Rupture for overall damage contribution. It is important to note that Envenom scales with our Mastery: Potent Poisons and Agonizing Poison but is unaffected by Master Poisonerand Zoldyck Family Training Shackles despite it being poison damage. Kingsbane : Our artifact weapon ability which becomes a big portion of our damage contribution with the fixes introduced in 7.1.5 along with the current bug(?) where Agonizing Poison applies 2 stacks of Kingsbane per application rather than 1 stack like Deadly Poison or Wound Poison does. Having near 100% Envenom buff uptime during Kingsbane is essential. Bag of Tricks : AKA Poison Bomb is one of the main reasons why Assassination damage can be so streaky especially during fights with multiple targets. This ability hits incredibly hard and scales with basically everything that amplifies our damage as it counts as a poison, however it’s potential is gated behind an RPPM system. The proc rate of this trait is approximately [1 + Haste] procs per minute and there aren’t really any ways to control when it procs so there’s no reason to try to play around it. Blood of the Assassinated : The 2nd most RNG trait providing huge bursts of damage as it essentially doubles your Rupture damage for 10 seconds on the target with a 35% chance to proc. As of now there is currently no benefits to try and “fish” for Blood of the Assassinated procs so there’s no reason to try and play around it when it does proc. The main reason for casting Rupture twice is because you always want to take advantage of the Pandemic effect which carries over up to 30% of the dot’s max duration onto the next application for Nightstalker empowered Rupture. 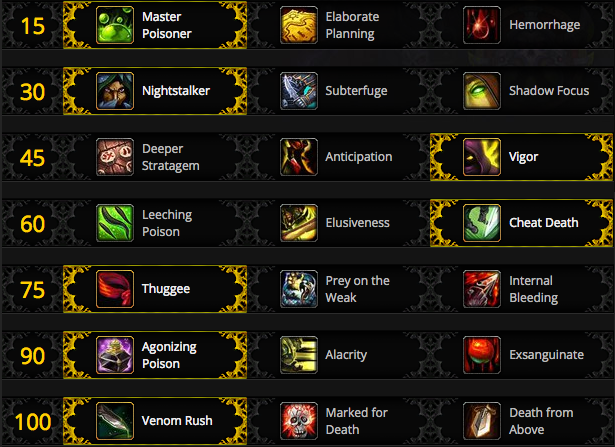 Envenom is immediately cast after Kingsbane and Mutilate in order to take advantage of the poison application buff. Maintain Rupture and Garrote on the target with near 100% uptime. Cast Mutilate as your CP generator. If Rupture has less than 6 seconds remaining on the duration then reapply the debuff, otherwise cast Envenom. (Important note: Do NOT overwrite a Nightstalker buffed Rupture or Garrote, the buffed damage doesn’t carry over. Wait until the last tick to refresh it.) Every finisher you use will apply the Surge of Toxins debuff scaling higher with more CP usage. Ideally all finishers will be used with 4 or more CP to take advantage of the Surge of Toxins debuff. Your main goal will be to clip your Surge of Toxins debuff with every Envenom cast, this means casting Envenom at the last possible second before Surge of Toxins runs out so that Envenom is boosted. Envenom isn’t directly effected by Surge of Toxins, but by the buffed up Agonizing Poison effect so it’s very important that you clip it every single time. If you’re familiar with the Elaborate Planning playstyle it’s very similar, you’re just replacing tracking the Elaborate Planning buff with the Surge of Toxins debuff. Anytime you’re energy starved and unable to consistently clip your debuff with a 4+ CP Envenom, just let it fall off and pool your energy until 150+ and then rinse and repeat the cycle. It’s better to let it drop off and pool your energy than to constantly struggle to clip the debuff and potentially miss out on a lot of extra damage. Rupture re-applications don’t follow the same rule as Envenom does for clipping because the damage from dots is updated dynamically instead of snapshotting so don’t worry about it too much. There is a huge window of burst where it is worth holding onto for example: Skorpyron’s vulnerable state where he takes 100% increased damage. Important to note: Surge of Toxins is a debuff therefore it applies to only one target. Make sure to always choose one main target to cast and clip your Envenom on if you have limited energy. I recommend using Garrote to keep track of your main target. Very similar to your single target rotation, just maintain bleeds and poisons on both targets. It’s fine to use a 3+ CP Rupture as your initial one. Mutilate is now replaced with Fan of Knives as your CP generator. Maintain bleeds and poisons on all 3 targets, same thing as two target cleave. Same as before with three target cleave, but instead of maintaining Rupture on every single target you just want to have enough bleeds going that you don’t run out of energy spamming your Fan of Knives and Envenom. At this point you just pray for Poison Bomb procs because that is where all your AoE damage is going to come from. Keep in mind there are no longer any special breakpoints especially for Crit because MP/Vigor/AP build is a lot less reliant on CP generation. As always stat weights are never set in stone and always changing depending on your gear. It is strongly recommended that you sim yourself after every upgrade in order to get the most accurate results. If you are unsure how to sim yourself there are plenty of detailed guides on how to properly sim yourself. What potion you use is largely dependant on the situation and whether or not you have Zoldyck Family Training Shackles. Potion of the Old War is purely single target while being stronger when paired with Bloodlust and Potion of Prolonged Power effects all targets you hit and is stronger when paired with Zoldyck Family Training Shackles under 30% health so choose accordingly which potion to use. Food: Nightborne Delicacy Platter with Barracuda Mrglgagh being a cheaper alternative. Despite the nerf to Master Assassin relics, our relic priority remains largely unchanged. This is due to the fact that Convergence of Fates introduced in Nighthold and Master Assassin has amazing synergy when paired together. Toxic Blades is a purely single target trait and despite it simming well, is going to always be the worst trait due to the nature of raids and progression never being about pure single target dps. 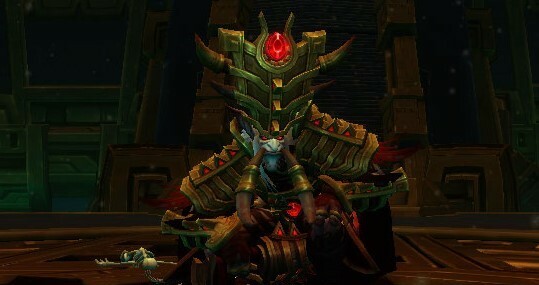 Master Assassin allows more casts of Vendetta which is essential to raids during progression as there are a lot of priority adds which usually require burst. Taking everything into consideration Master Assassin remains the best choice even without a Convergence of Fates. It is also the easiest relic to aquire as of 7.1.5 because 2 drop in Nighthold and the 3rd drops in Trials of Valor meanwhile, there are only 2 Toxic Blades relics and 1 Gushing Wound relic that drops from Nighthold and Trials of Valor. If you are lucky enough to loot Duskwalker’s Footpads it is recommended that you use 2 Master Assassin 1 Gushing Wound with Convergence of Fates so you can easily line up your Vendetta with Kingsbane With the latest hotfixes nerfing Kingsbane double application, I recommend using 3 Master Assassin relics instead and just using Vendetta on CD while still following the rules for delaying Kingsbane. Keep in mind that there is never going to be a 100% correct BiS list due to the RNG nature of warforging along with the Legendary system. This list is mostly used to give you a rough idea of what bosses you want to spend coins rolling loot on. Tier pieces would be ranked Helm > Cloak > Pants > Chest > Shoulder > Gloves. If you’ve made it this far in the guide I really appreciate you taking the time to look over it as this is my first guide and I want to be as thorough as possible with it. Any suggestions for future guides are greatly appreciated, just leave a comment below or message me whenever I’m streaming at twitch.tv/yazuki. Legion Patch 7.1.5 has just been deployed across all regions. We have created the optimal preliminary talent builds for single target DPS. This gear set includes pre-Nighthold gear. 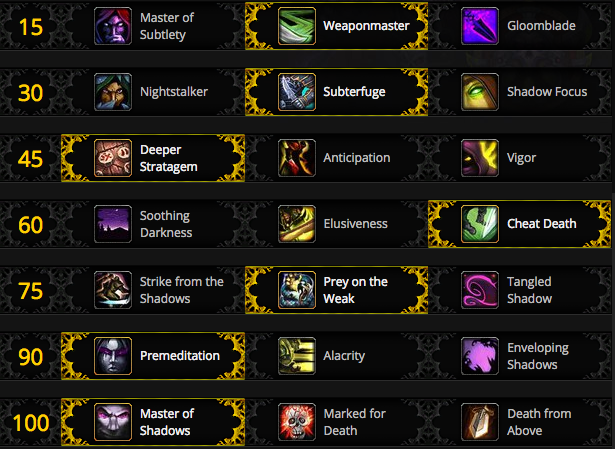 These are the talent builds that you will use for Nighthold progression. We expect the builds to change once set bonuses come in to play. More detailed information can be found in the guides. 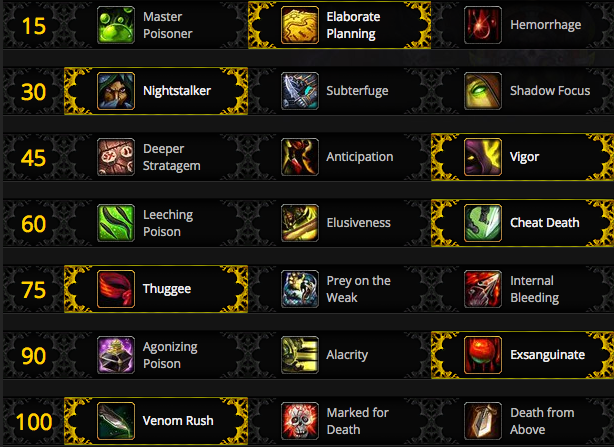 For Single Target, Master Poisoner is now the more optimal level 15 tier talent to choose. This is due to a nerf to Elaborate Planning from 15% to 12%. Mastery will also be more valued with the scaling of this build. Although EP buff maintenance is no longer a part of the play-style with this build, the artifact trait Surge of Toxins has the same duration and plays roughly the same, it is triggered by envenom; its duration is a static 5 seconds like EP, however its effect’s strength scales with the number of Combo Points spent on the envenom. For Single Target, the change from the live standard Exsanguinate build is the selection of Vigor over Deeper Stratagem. This is primarily due to the Deeper Stratagem nerf from 10% additional finisher damage to 5%, as well as the change in Rupture’s scaling design; the DoT value of Rupture has been standardized and no longer scales with CP, hence negating the additional potency of a 6cp Rupture from live over a lower-cp funded one. Increased combo point expenditure on Rupture now only makes it last longer, with the average damage done over it’s duration remaining unchanged. For Single Target, the standard build still applies, with Ghostly Strike still being the best level 15 tier talent, however Quick Draw is still the optimal tier talent over Ghostly Strike for Greenskin’s Waterlogged Wristcuffs wearers. The talents for subtlety remain largely unchanged for single target. 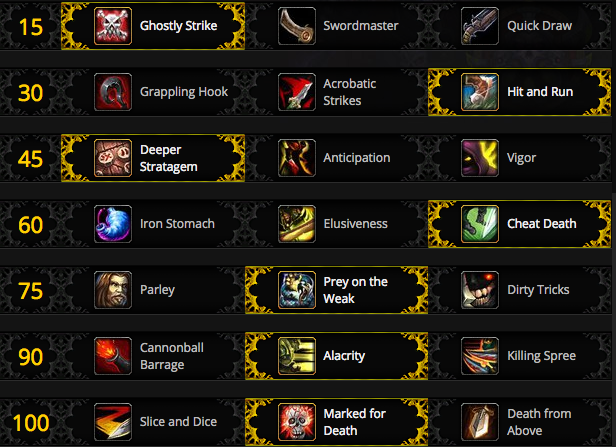 For the level 15 tier of talents, however, Weaponmaster is now the go-to. 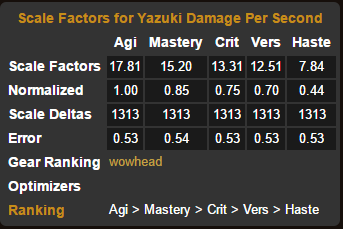 The reason for this being a DPS gain over Master of Subtlety is due to the extra energy regen from WM procs counteracting the Master of Shadows nerf from 30 to 25 energy. All of these results are derived from Aethys’ simulations on his spreadsheet and are updated for patch 7.1.5. Simulations provide a good example of how a spec plays over the course of a patchwerk fight, however in-game experience has additional factors such as mechanics affecting uptime, and ability RNG (Especially with abilities like Roll The Bones) may vary from the ideal situations that sims present. 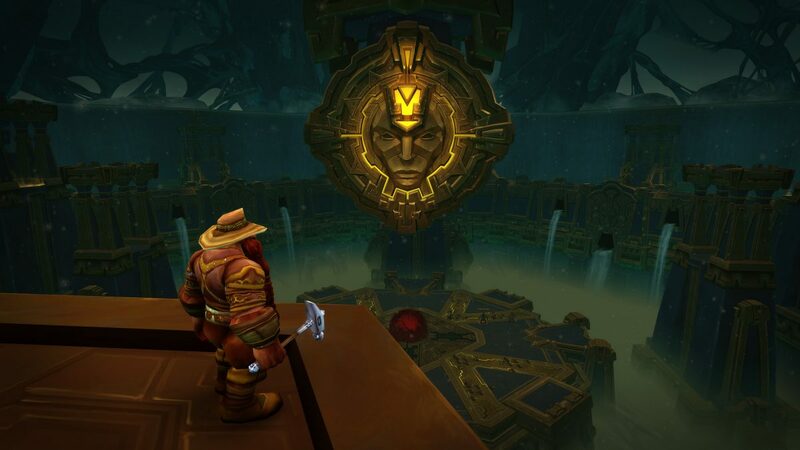 A range of data from in-game testing as well as logs on various fights on Warcraft Logs can reflect the realistic execution of the ideal situation that simulations present.